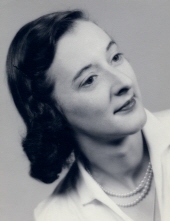 Annette Mary Tobin, age 89 of Troy for 60 years, passed away Sunday, January 27, 2019 at St. Anne’s Mead in Southfield. She was born October 29, 1929 in Troy Township to John and Mary Risch. She is survived by her children, Michael (Cynthia) Tobin, Carol (Jerry) Mahrle, Catherine (David) Griffith, Douglas (Cynthia) Tobin, and Patrick (Maureen) Tobin; brother, Leonard Risch; ten grandchildren; and five great grandchildren. She is preceded in death by her husband of 40 years, Jack (1989), whom she married October 1, 1949 in Birmingham; and her parents. Memorial contributions would be appreciated to the Michigan Humane Society. To send flowers or a remembrance gift to the family of Annette Mary Tobin, please visit our Tribute Store. "Email Address" would like to share the life celebration of Annette Mary Tobin. Click on the "link" to go to share a favorite memory or leave a condolence message for the family.